Congratulations to Adam Huska on signing his first professional contract with the New York Rangers. Huska, a 2015 Rangers draft pick, signed a two year deal after a three year collegiate career at the University of Connecticut where he was coached by Pro Crease Goaltending Director of Coaching, Matthew Michno. On March 15th, Adam posted his first professional victory playing with the Rangers' AHL affiliate Hartford Wolf Pack by defeating the Utica Comets 5-3; Adam made 25 saves in the win. The Wall Street Journal reports that girl's hockey is on a significant growth curve with participation up 25% from five years ago and doubled since 2000. "The popularity of girls hockey has taken off and I think a lot of that has to do with role modeling that emanates from girl's Olympic success and even the recent participation of Kendall Coyne at this year's NHL All Star game who competed in the fastest skater event" (the first woman to do so) says Scott Hamilton, 1984 Olympic figure skating champion. At Pro Crease Goaltending, we've noticed the same growth curve which is the reason we created a women's only camp three years ago and this year, in addition to the women's day camp, we're offering a three-day women's overnight camp. "Women are looking for the same level of coaching as men and we've been able to bring in elite women's coaches from top collegiate programs" says Jared Waimon, Owner/Founder Pro Crease Goaltending. Check out our 2019 women's camp schedule below or on our website. For the complete Wall Street Journal article, press here. Pro Crease Goaltender Tomas Vomacka, a freshman at the University of Connecticut, has been heating up over the past month highlighted by a 29 save 5-0 shutout by the Huskies over Merrimack College on February 9th. The following Friday in a thriller that went to overtime UCONN defeated offensive juggernaut Boston University 3-2. Pro Crease Goaltending Director of Coaching, Matthew Michno, has been the Goaltending Coach for the University of Connecticut for the past two seasons. Matthew works daily with both Tomas, a Nashville Predators draft pick in 2017, and Adam Huska a 2015 New York Rangers draft pick. Keep up the good work Tomas and Matt! Stone to Represent Team USA! A huge congratulations to long time Pro Crease Women's Goaltender, Hannah Stone on being named to USA Hockey's 2019 U.S. Women's National University Team! Hannah along with 21 other players will compete in the 2019 Winter World University Games from March 1-9th in Krasnoyarsk, Russia. Hannah both grew up and played her youth hockey in Connecticut prior to attending the Westminster School where she continued to train with Pro Crease Goaltending. Hannah is an original attendee of the Pro Crease Women's Summer Camp and a tremendous influence on her fellow teammates and women goaltenders. Pro Crease Goaltending is running two Women's Camp this summer! For more details click here. "Goaltending, weaponized: How the next generation of goalies is ready to dominate"
Pro Crease Goaltending was recently featured in The Athletic, a subscription-based sports news website that provides national and local coverage of professional and college sports. The author, Boston Bruins' beat writer Fluto Shinzawa, provided a unique perspective to the article: he attended a Pro Crease training session on skates! With an emphasis on how today's emerging goaltenders are being trained, the article features Pro Crease owner/founder Jared Waimon, director of instruction Matt Michno, AHL veteran Scott Munroe and sports psychologist Jason Emery. See the following excerpts; the entire article is available via the link below. "A warning to shooters: You are in trouble: The next wave of goalies is approaching. They are equipped with tools granted to no other generation"
Meanwhile, NHL teams are learning that sky-scraping size is no longer a priority. Shorter goalies once bypassed without a second thought are now given proper consideration. The result: a deeper pool of smart, technical, athletic and confident goalies. It's why goalie coaches like Waimon have turned their teaching manuals upside down. Stay up, they say. Shuffle, don't slide. Think through the game instead of executing pre-programmed technique. The psychologist's talk is about fortifying the muscle that is regularly under attack from bad goals, surging crowd noise, teammates' misplays and equipment malfunctions. The trick for every goalie is to maintain performance when things go sideways. "It's not a trait you're born with. It's just not," Emery tells the students. "Anybody can develop this. It is a process. For the full article please, click here. Three Pro Crease Goaltenders Make NHL Scouting Rankings' Top 20! The N.H.L. 's Mid Term Central Scouting rankings were released last week and three Pro Crease Goaltenders found themselves on the North American Top 20 list. Spencer Knight, who currently plays with USA Hockey's National Team Development Program, is ranked #1. Spencer is a Darien, CT native who previously played for Avon Old Farms Prep School, Mid Fairfield Youth Hockey and Darien Youth Hockey. Spencer has trained exclusively with Pro Crease Goaltending since he began playing the position. Henry Wilder, who is having a remarkable season at the Hotchkiss School, is ranked #14. Henry has been working exclusively with Pro Crease Goaltending Coach Mackenzie Bruch while at Hotchkiss. Henry has shown tremendous dedication to his game and trust in Mackenzie! Alex Aslanidis, current Avon Old Farms goaltender, is ranked #20. Hailing from Moorestown, NJ, Alex began working with Pro Crease Goaltending Owner Jared Waimon after Jared saw Alex at a USA Hockey tryout as a first year Bantam. Congratulations Spencer, Henry and Alex! Congratulations to Thatcher Demko on his recent call-up to the NHL! Thatcher is currently rostered with the Vancouver Canucks, the team that originally drafted him 36th overall in 2014. Thatcher is a graduate of Boston College and also an alumnus of the USA Hockey National Team Development Program.. Thatcher began training each summer with Pro Crease Goaltending Owner Jared Waimon three years ago. He is a regular attendee of the Pro Crease Goaltending Elite Week Summer Camp held at Quinnipiac University each July. We are proud to have been with you every save of the way! Good Luck to All Our Prep School Goalies! 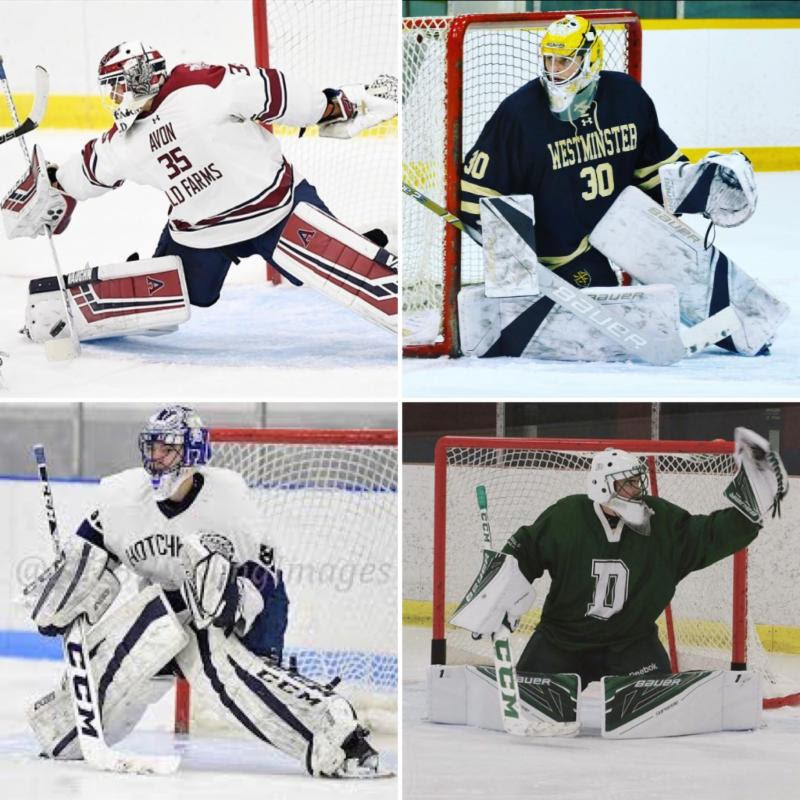 Being located in New England, Pro Crease Goaltending has a number of goalies playing at numerous prep schools. The prep school level provides an amazing opportunity to pursue both academic and athletic excellence! 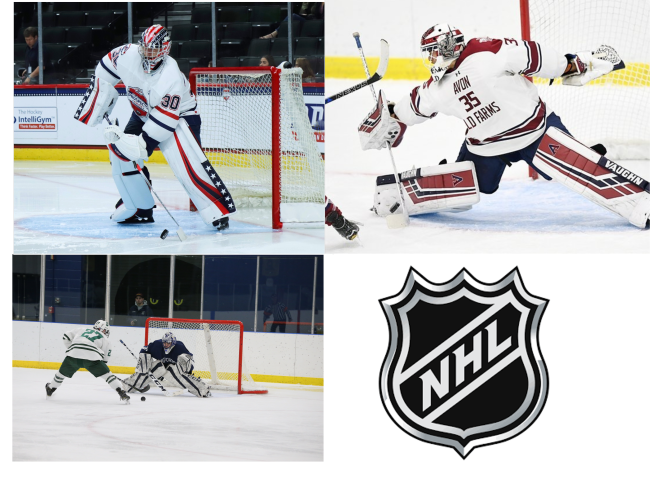 A special congratulations to a few Pro Crease Goaltenders who made Varsity in their first year at prep school showing that the Pro Crease Goaltending practice works! Pro Crease Goaltending is proud to a have special relationship with these schools by providing in-season instruction for their goaltenders. The Quinnipiac men's ice hockey team picked up its third consecutive win to open the season Friday night as the Bobcats shut out the No. 18 Boston College Eagles 1-0 in front of a sold-out crowd of 3,625 in the Frank Perrotti Jr. Arena at the People's United Center in Hamden. Sophomore goaltender Keith Petruzzelli is off to an impressive start: 3-0-0, 1.34 GAA and a .931 save percentage. Keith is a 3rd round draft pick of the Detroit Red Wings. Pro Crease Goaltending Owner, Jared Waimon, is entering his 5th year as the Goaltending Coach at Quinnipiac University. 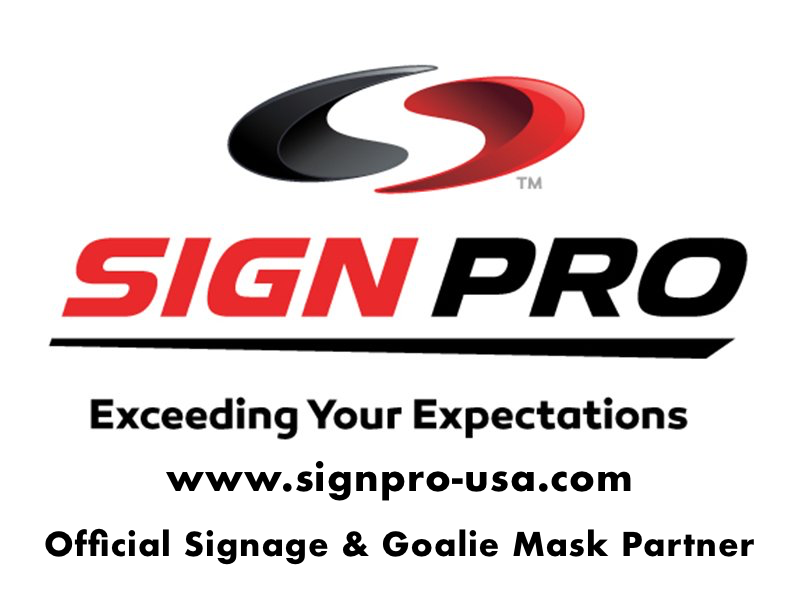 Pro Crease Goaltending is proud to announce that Sign Pro, located in nearby Plantsville, CT, has become our newest corporate partner. A worldwide provider of signs for over 25 years, we're excited to report that Sign Pro has recently entered the goalie mask decoration business (see sample below). As more and more goalies look to personalize their masks, the high cost and time associated with painting and/or other finishing can often be difficult to overcome. Instead, Sign Pro's graphics department will work with Pro Crease clients to design their exclusive mask and then utilize a 3M graphic wrap to affix to the helmet. The result, as per the photos below, is a beautiful, customized mask with the look and feel of paint minus the cost and time involvement. Several benefits of this process include not only time and cost but also the ability to change-out mask designs without having to purchase a new helmet. Pro Crease Goaltending owner/founder Jared Waimon says "We are very often approached by students seeking how and/or where to get their masks decorated. Sign Pro's customization process is cost-effective and looks fantastic. We're confident their commitment to outstanding customer service and product expertise is on par with that of our own." "Sign Pro is proud to partner with Pro Crease." Says Pete Rappoccio, Owner/Sign Pro. "Innovation is a major part of Sign Pro's belief system. If you are not cutting edge, you are behind the curve. Pro Crease shares the same values. For this reason, the Sign Pro and Pro Crease brands are a complementary match." Pro Crease Launches New Video! Pro Crease Goaltending is excited to announce that our first-ever company video is ready to be seen! We're confident the video will further establish our credibility and stature in the goaltending instruction marketplace and enhance our coaching and camper recruiting as well as other business partnerships. Thanks to our sponsor, Reel Sports Productions, for a great job in producing this brief but impactful video! Please watch the video above or click here. Thanks for making Pro Crease your choice for premier goaltending instruction and development! Pro Crease Goaltending Welcomes Mackenzie Bruch! Pro Crease Goaltending is very excited to announce our newest staff member, Mackenzie Bruch. Mackenzie comes to us all the way from Minnesota demonstrating once again that Pro Crease Goaltending is quickly becoming a destination of choice for America's top goaltending coaches. Prior to joining our staff, Mackenzie was the Graduate Assistant Coach for the Bemidji State University Women's Team, a NCAA Division 1 team in the Western Collegiate Hockey Association. In addition to earning a Master's Degree in Business Administration, her coaching accolades are impressive as well and include having coached the USA Hockey Girl's National 15 Camp as well and the Minnesota High Performance 15 Camp. Mackenzie was a stand-out goaltender at Bemidji State University and at Culver Academy prior to pursuing coaching. Knight & Petruzzelli Represent USA Hockey! Congratulations to Pro Crease Goaltending students Spencer Knight and Keith Petruzzelli on their invitation and recent performance at the 2018 World Junior Summer Showcase ("WJSS") in Kamploops, British Columbia. The WJSS provides the opportunity for a country's top U20 players to compete against each other. This year's week-long camp featured 11 international competitions between Canada, Finland, Sweden and the United States. Many of these players will be chosen by their respective countries to compete in this year's World Junior Championship which will take place at Christmas time in British Columbia. This year's USA Hockey's goaltending coach is Pro Crease Goaltending Elite Week Coach David Lassonde from Dartmouth University. Coach Lassonde won a Gold medal in this event back in 2013. We would like to thank all of our amazing campers from our Newington Evening Camp that concluded this past Thursday. Every day was more fun and exciting then the next. Throughout the camp there was a huge emphasis on puck handling, lateral release and making great glove and blocker saves! Dr. Jason Emery gave two talks that greatly resonated with our goalies. He is a tremendous asset to our culture and camps. We look forward to our remaining 2018 summer camps. If you have not yet enrolled, we have 3 spots avaiable in our Avon Old Farms Evening Camp running August 13 - 16th. Pro Crease Goaltending goaltender, Quinten Laurentino recently attended tryout camp for the N.A.H.L. 's latest expansion team, the Maryland Black Bears. "Q" was the only 2002 birth year goaltender to be invited to the camp. After competing against 15 other goaltenders as much as 4 years older than himself Q earned an invite to the team's upcoming final tryout camp. Quinten is a Pro Crease Goaltending veteran of a number of different camps and clinics. He has played for the L.I. Royals for 4+ years. We are very proud of his recent success. Caliguri & Busky Head to Buffalo! Congratulations to two of our Women's goaltenders, Grace Caliguri and Amanda Busky, on advancing from the New England District tryout to their respective birth year USA Hockey Select Women's Festivals in Buffalo, NY. Grace will be competing in the Select 15 Festival this summer. Currently, Grace plays at the Loomis Chaffee School in Windsor, CT. Grace has trained with Pro Crease Goaltending for over six years. Amanda Busky will have the opportunity to play with her fellow 2002 birth year players at the Select 16 Festival. Amanda an Ellington, CT native currently plays at the Westminster School. Pro Crease Goaltending has worked with the Westminster School for 10 years! Both Grace and Amanda were participants in the Inaugural Women's Camp. This year's Women's Camp will take place June 25th - 28th at the Newington Arena. Only 5 spots remain for this camp. Each goaltender will enjoy coaching from the best women's staff available including: Tara Connolly (RPI), Mike Mammone (Trinity), Amanda Mazzotta (Quinnipiac), Edith Racine (Cornell) Allison Quandt-Westgate (Lowell) and Mental Performance Coaching by Dr. Jason Emery.